MANILA, Philippines - (Updated as of 12:05 p.m. May 12) The partial and unofficial election result for senatorial race is available online based on data from the Commission on Election (Comelec) Transparency server. The Comelec said that it would only canvass the results for the Senate including the party-list race. The canvassing of votes for the presidential and vice-presidential race is the sole jurisdiction of Congress sitting as the National Board of Canvassers, according to the poll body. The 12 candidates with the highest number of votes on today's election will join the the winners of the 2013 election to form the 17th Congress of the Philippines. 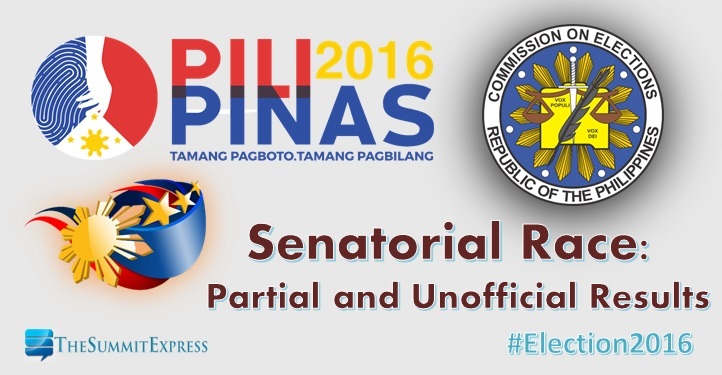 The 2016 general election will be the 32nd election for the Senate of the Philippines. Here's the live updates for senatorial race - partial and unofficial Comelec election results. In the Pulse Asia's recent survey, old-times dominated the race, the Magic 12 were: Senate President Franklin Drilon, Sen. Vicente Sotto III, former senators Francis Pangilinan, Juan Miguel Zubiri and Panfilo Lacson, Sarangani Rep. Manny Pacquiao, former Akbayan representative Risa Hontiveros, former Technical Education and Skills Development Authority chief Joel Villanueva, Sen. Serge Osmeña III, former senator Richard Gordon, former justice secretary Leila de Lima, Sen. Ralph Recto and Valenzuela City Rep. Sherwin Gatchalian. 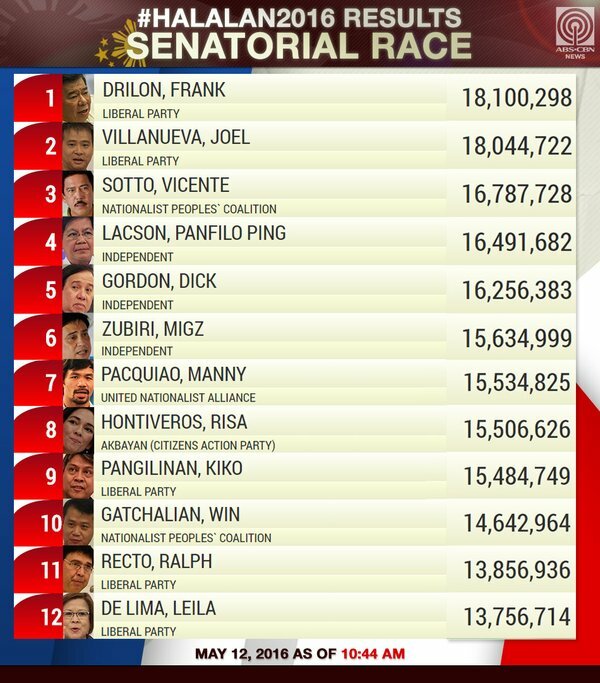 The same names also appeared on the final SWS survey with Drilon and Sotto hold the top two spots.